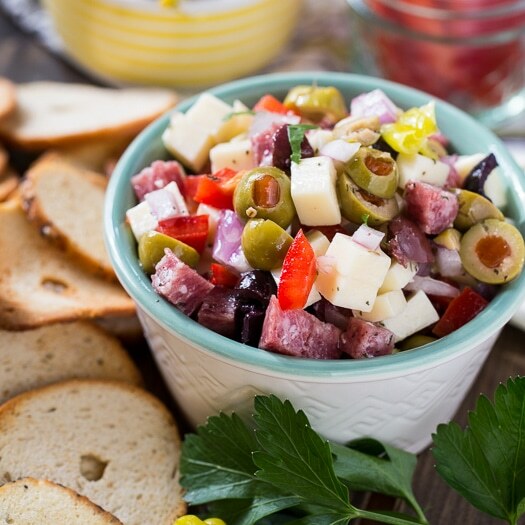 Muffaletta Dip has all the flavors of a Muffaletta sandwich in dip form. This is a recipe you’ll want to make again and again. It’s perfect for game day and of course Mardi Gras and it’s best if made in advance so the flavors have time to mingle. Muffalettas are popular New Orleans sandwiches stuffed with meats, cheese, and olive salad. Kind of like an Italian sub, but much better. 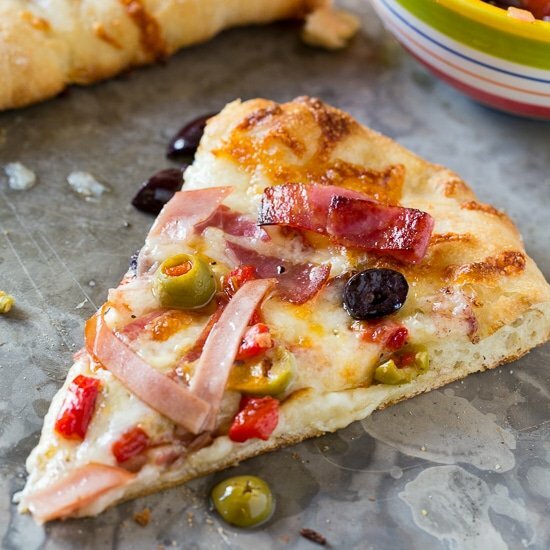 Typically a muffaletta will have ham, salami, and maybe mortadella. 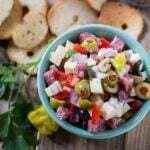 The olive salad usually is made from olives, pepperoncini, garlic, vinegar, and maybe some capers, roasted red peppers, or pickled cauliflower. 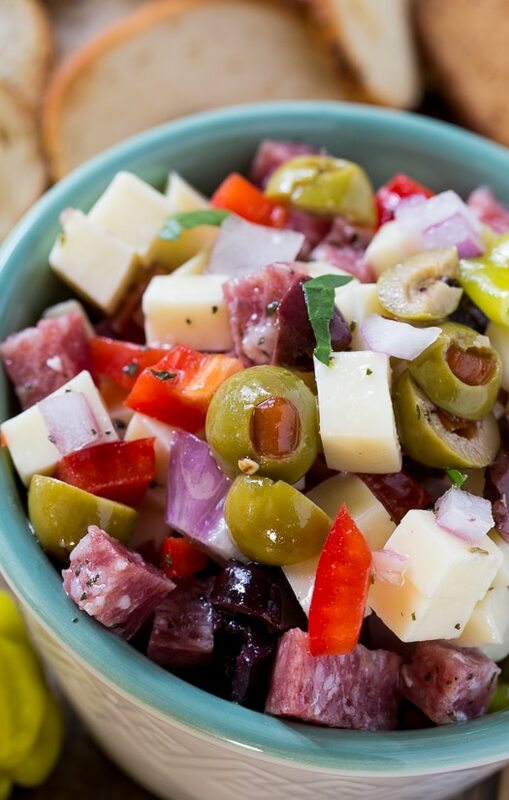 For this Muffaletta Dip, I’ve used Monterey Jack cheese, salami, olives, red onion, roasted red peppers, olive oil, red wine vinegar, pepperoni, and some herbs. It tastes great on toasted Italian bread. Try tossing the leftovers into a regular green salad and you instantly have a gourmet salad. Muffaletta Dip has all the flavors of a Muffaletta sandwich in dip form. 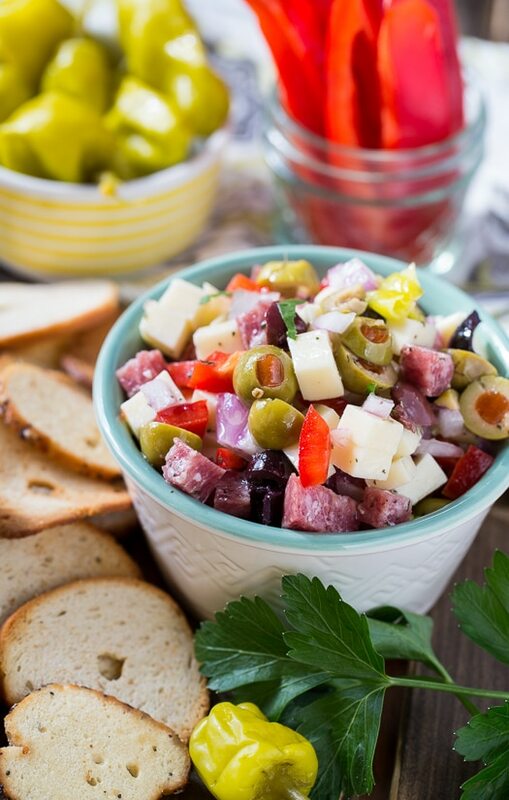 Salami, cheese, and olives make this an unbeatable appetizer. 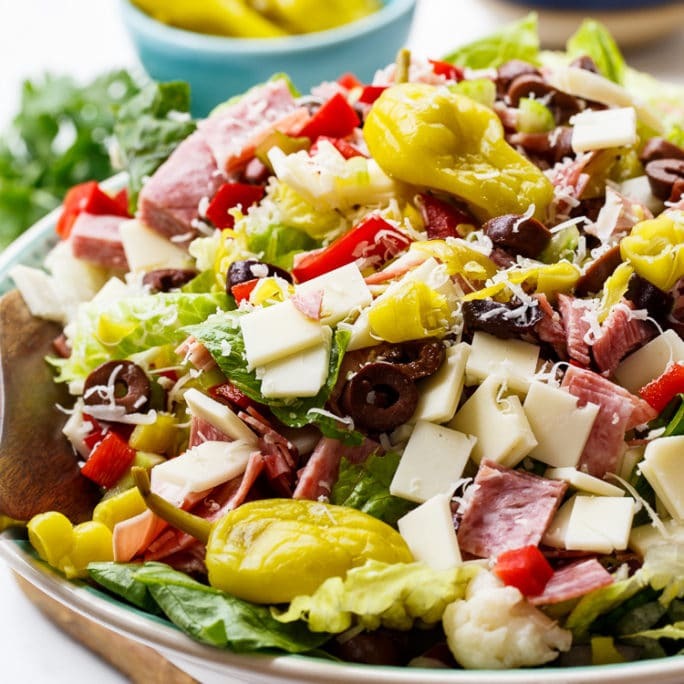 Combine cheese, salami, onion, roasted red pepper, olives, and pepperoncini in a large bowl. In a small bowl, whisk together oil, vinegar, pepperoncini liquid, garlic, basil, thyme, and red pepper flakes. Pour on top of cheese and salami mixture and mix in. Sprinkle parsley on top. Refrigerate for at least 1 hour before serving. This entry was posted in Appetizers and tagged Mardi Gras, muffaletta. Bookmark the permalink. The dish is very attractive and outstanding, the dish is very nutritious. I really like this dish, very nutritious.